With kitten season now in full force, it’s more important than ever to spread the word about cerebellar hypoplasia. 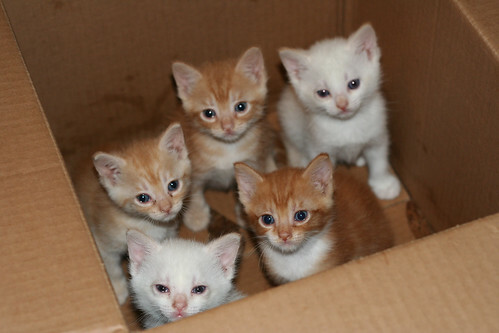 Each year between March and November, thousands of kittens are born and end up in shelters. While most litters will likely be normal in most regards, some may have special needs like CH. Most people who are unfamiliar with CH may immediately think wobbly kittens are sick or injured. Their first thought may be to “put them out of their misery” by either bringing them to the vet to be euthanized or coming up with their own solution. No matter if you’re stopping by your vet, chatting with a friend who feeds ferals, or volunteering at your shelter, you can help inform your vet, shelter and the public about CH. What’s even better is if those folks view you as a resource — a go-to person in case they come across a CH cat or if someone in the community is interested in adopting a CH cat or has questions. If you’re not sure what to say, that’s OK too. A while back, Elise played a vital role in creating these great cerebellar hypoplasia awareness fliers. So when you have a spare moment, print a few out and bring them with you during your next vet or shelter visit. You’ll all be glad you did! These fliers will help open the lines of communication so you can discuss what having CH means, how it can impact kittens and how they can live full and happy lives with folks who may not know much about it. By spreading awareness you can help save lives!